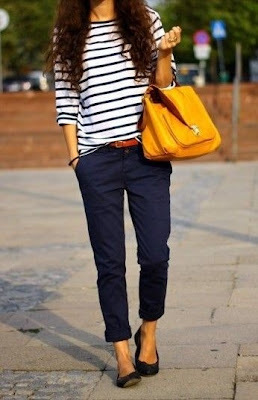 This wouldn't be a difficult outfit to recreate, you probably have most of these items in your closet already. However, as you know, I am obsessed with stripes and just love this entire outfit. I put together a similar look using items from Forever 21, ModCloth, and Rachel Rachel Roy. Click on any of the images below to purchase (I also love these Zara trousers, which I own after seeing them on Veronika). You can also click HERE for an alternative striped top option. I own those Zara pants as well. Love this look on Pinterest. Great find.